"An Uplifting Experience: The Cajon Valley: 70 Ma of Textbook Geology"
"2013 California Building Code Update"
[AKA: Mitigating Blasting Impacts without Diminishing Effectiveness]"
"2014 AEG/GSA Jahns Lecturer In Southern California"
"Paleoseismology; Has it Reduced Seismic Hazards, and if not, How Do We Change Course?" 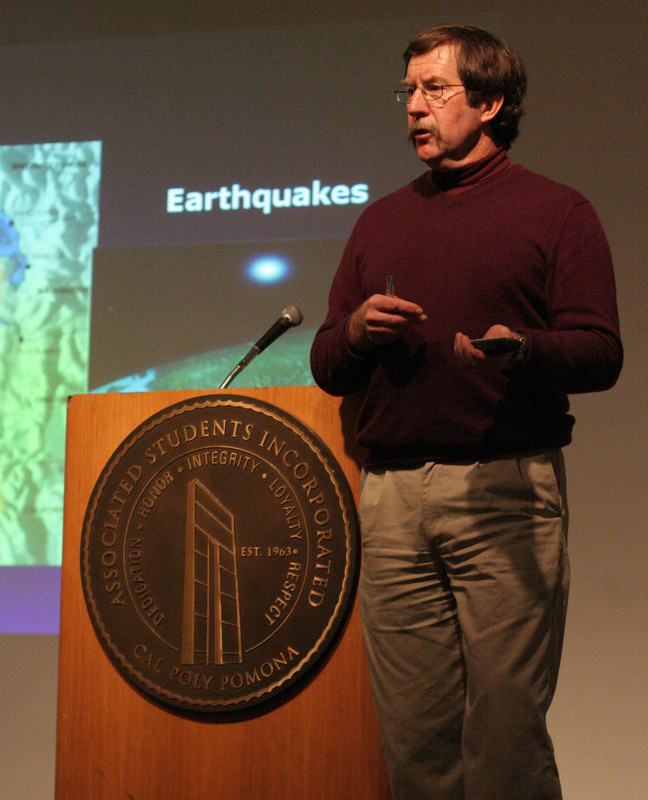 Paleoseismology; Has it Reduced Seismic Hazards, and if not, How Do We Change Course? MolyCorp "An Update On Project Phoenix, The Re-opening Of The Modernized Mountain Pass Rare Earth Element Mine, California"
And "20th Anniversary Of The Founding Of The Department Of Geological Sciences At California State University, San Bernardino"
Materials: "Historical Development of the Petroleum Industry in California"
The Landslide That Ate Laprak. Executive Officer, California State Mining and Geology board "STATUS AND RELEVANCY OF LICENSURE AND REGISTRATION OF GEOLOGISTS AND GEOPHYSICISTS IN CALIFORNIA AND ITS IMPLICATIONS"
Tuesday April 14, 12pm (noon), UC-Riverside Hewett Club, Geology Dept. 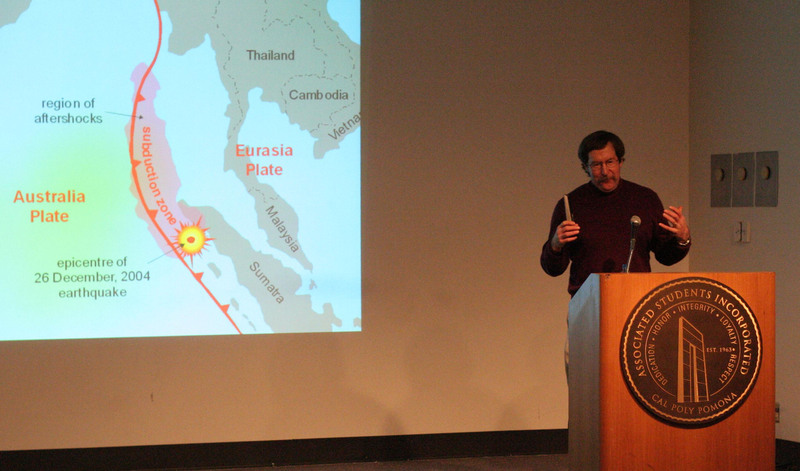 "Of Elephants, Earthquakes, Caves and Hot Rock - Recent Geological Engineering Adventures"
Wednesday April 15, 2:30pm, CSU- San Bernardino, Geology Dept. "The Comforts of Ignorance and the Benefits of Arrogance: Lessons of the Failure Kind for the Geopractitioner"
Thursday April 16, 12pm (noon), Cal Poly Pomona, Geology Dept. 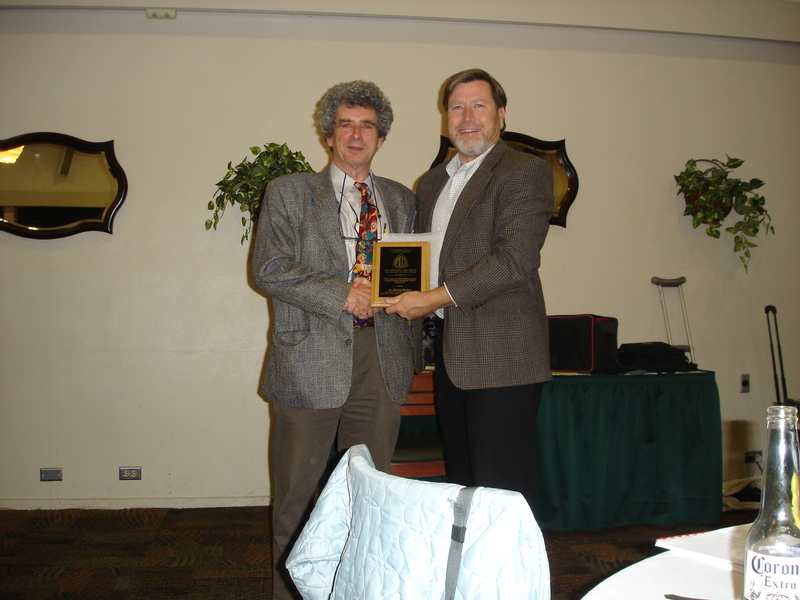 "Forensic Investigation of the Sea Cliff Incident, an Urban Catastrophe"
Dr. Ed Medley receiving a plaque of appreciation from Chapter Chair Kerry Cato at the Cal Poly Pomona Kellogg Center. 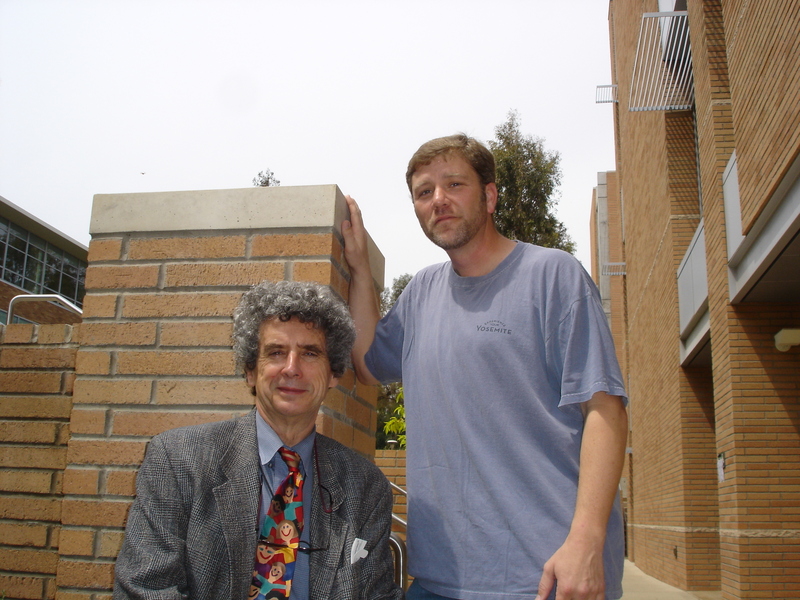 Dr. Ed Medley and UC-Riverside graduate student Rob Ellis. 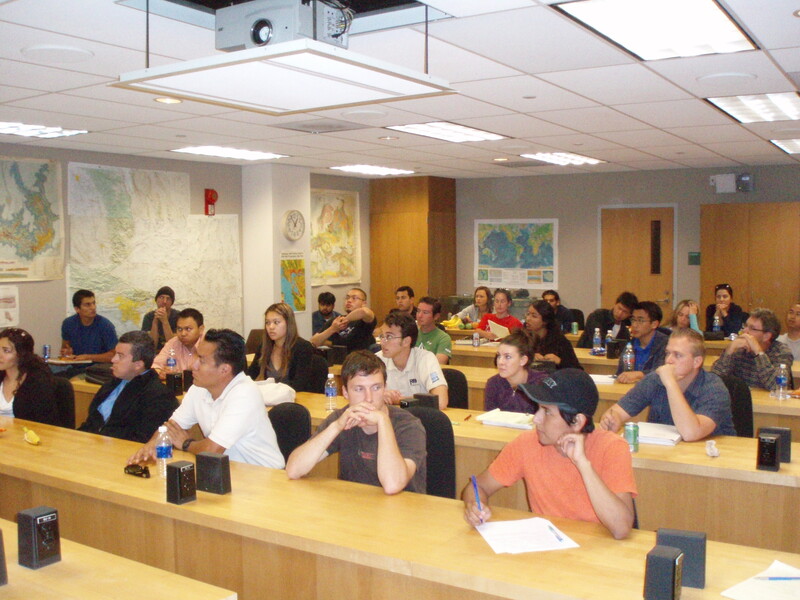 UC Riverside geology students listening to the lecture titled, "Of Elephants, Earthquakes, Caves and Hot Rock - Recent Geological Engineering Adventures". 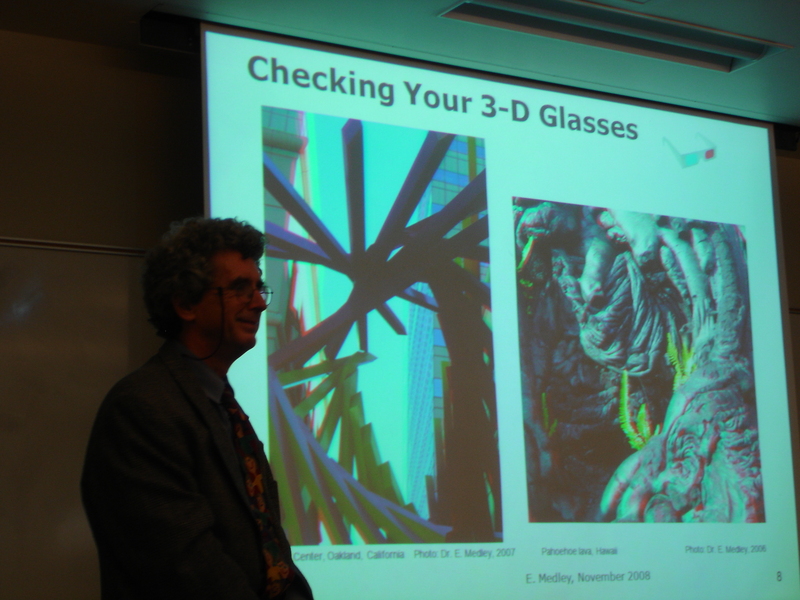 Dr. Medley showing UC-Riverside students the use of 3D stereo-photos in a presentation. 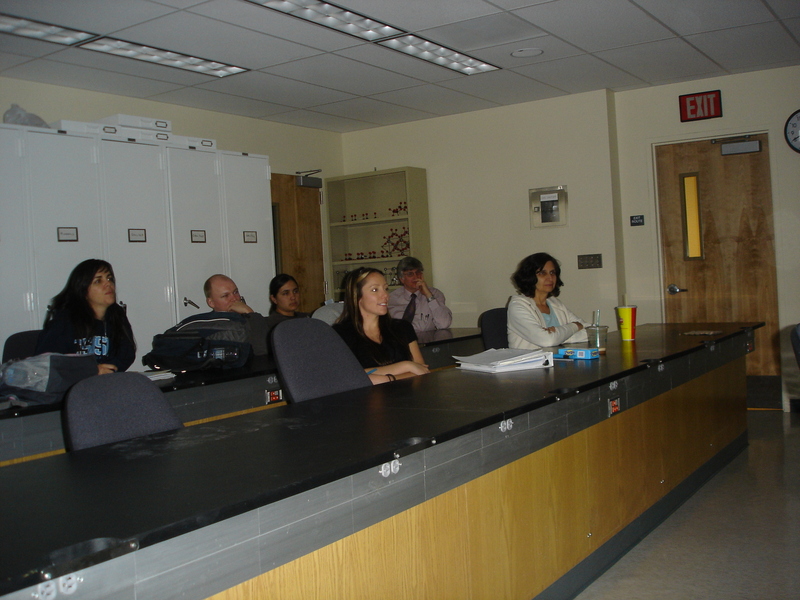 CSU San Bernardino Geology students listenting to the lecture, "The Comforts of Ignorance and the Benefits of Arrogance: Lessons of the Failure Kind for the Geopractitioner". Cal Poly Pomona students and guests simulate the narrow window of view that a borehole represents in a site investigation. 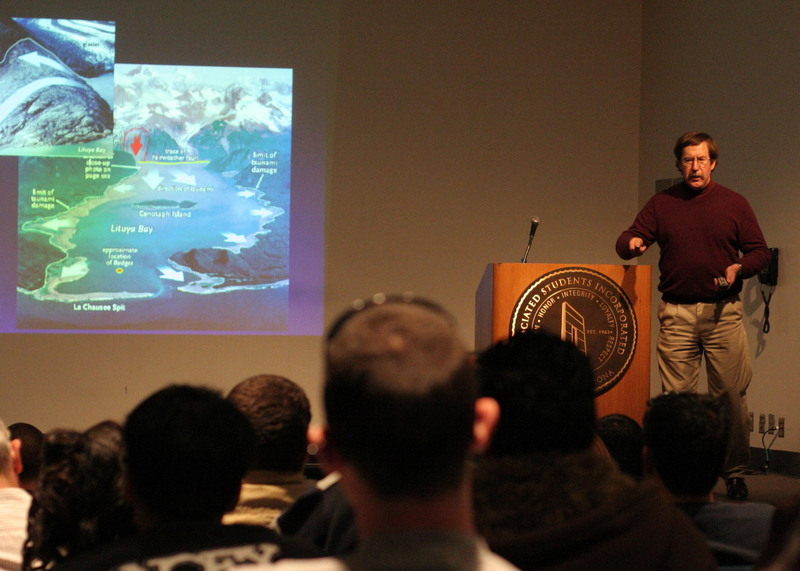 This lecture was titled, "The Least You Should Know About Characterizing Geological Chaos: Bimrocks". 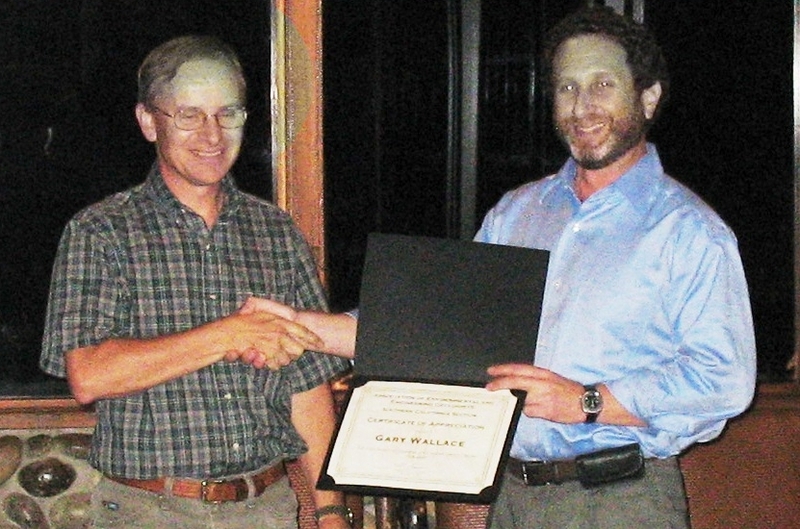 March 14 Field Trip "Hydrogeology of Springs in the Palm Springs Area: Field trip to Indian Canyon and Agua Caliente Springs"
February 19 & 20 AEG Shlemon Specialty Conference "Investigation, Risk Analysis, and Mitigation of Surface Faulting"
Newsletter Editor Rick Gundry (L) receives a Certificate of Appreciation from Former-Chairman Mike Cook (R). 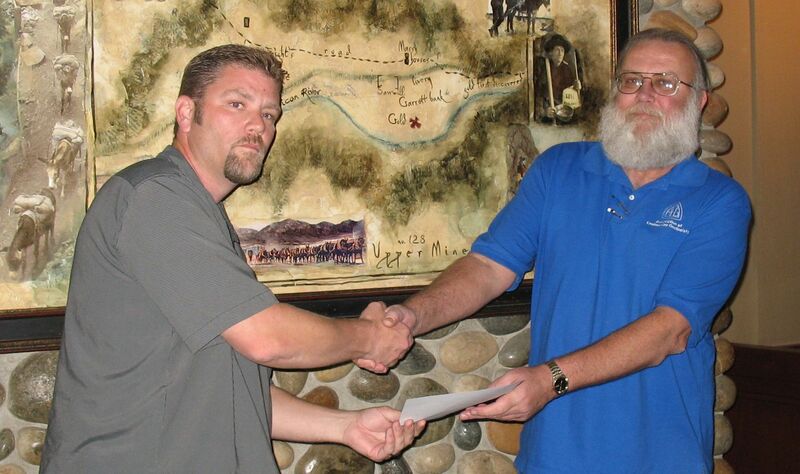 Secretary Dave Gaddie (L) receives a Certificate of Appreciation from Former-Chairman Mike Cook (R). 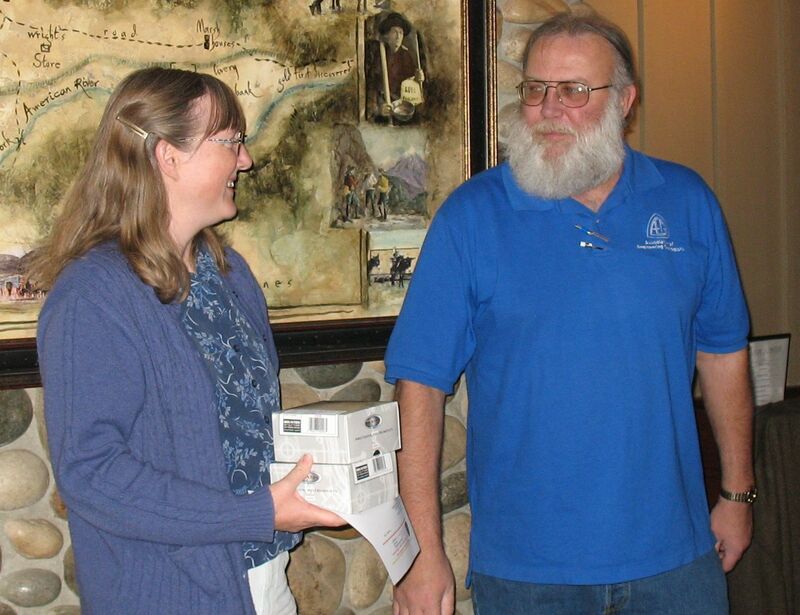 Brent Ritzinger (R), a BS student from Cal Poly Pomona, receives a Brunton Compass from Former-Chairman Mike Cook (L). 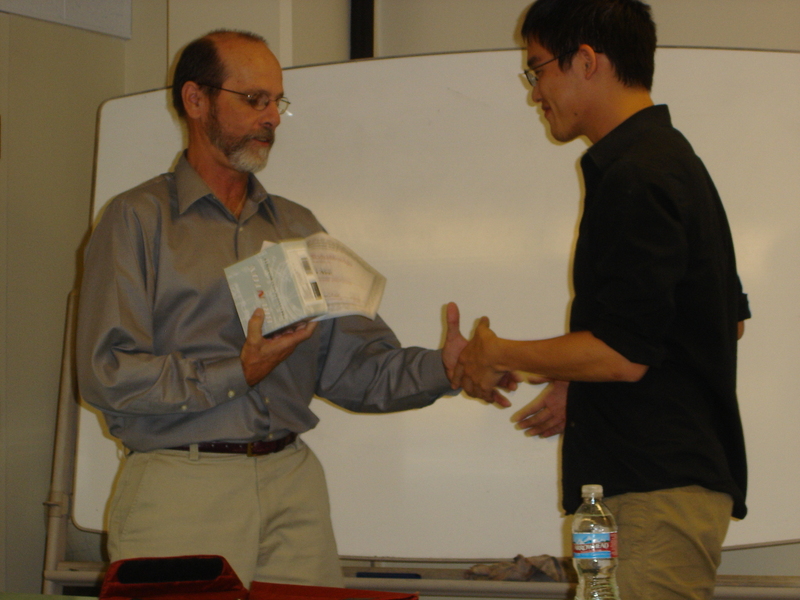 Phillip Nee (R), a MS student from UC-Riverside, receives a Brunton Compass from Former-Chairman Mike Cook (L). 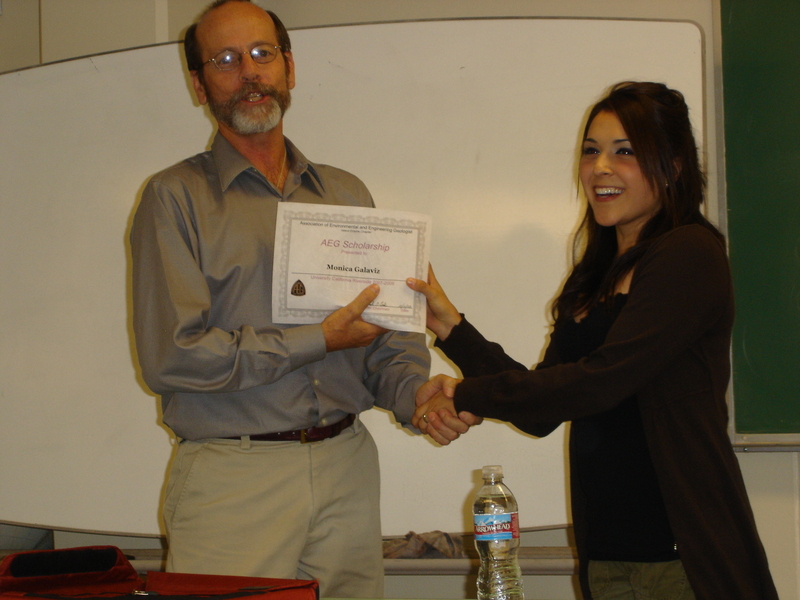 Monica Galaviz (R), a BS student from UC-Riverside, receives a Brunton Compass from Former-Chairman Mike Cook (L). 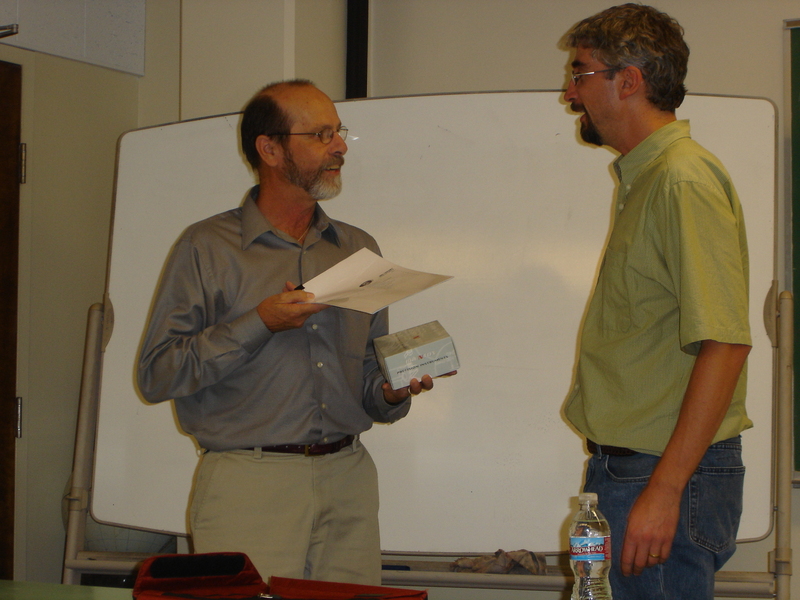 Dr. David Oglesby R), Associate Professor of Geology from UC-Riverside, accepts a Brunton Compass for the Department from Mike Cook (L). 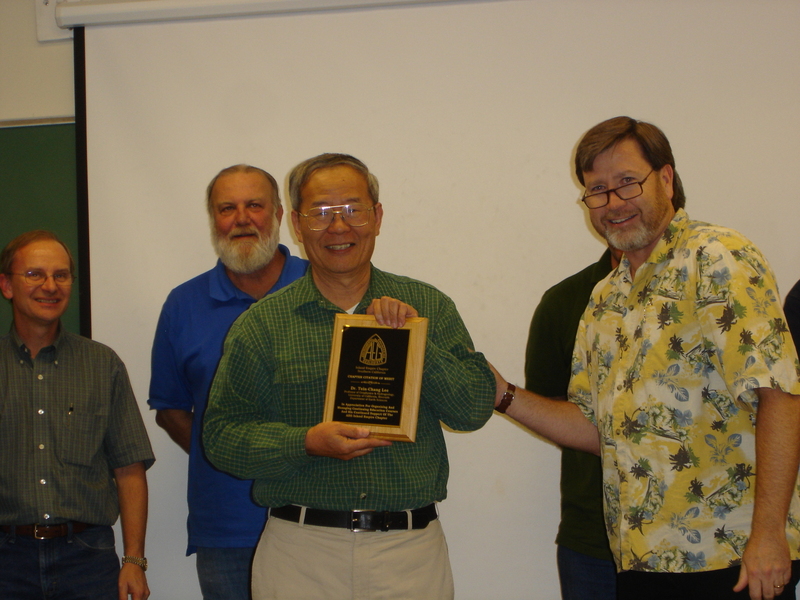 Dr. Tien Lee (L) receives a Citation of Merit from Chapter Chairman Dr. Kerry Cato (R). 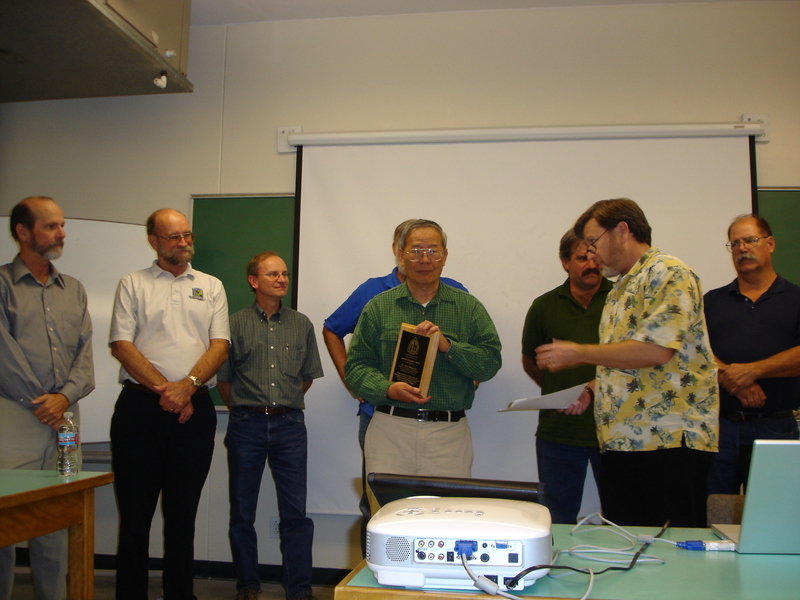 Dr. Tien Lee (Center with plaque) after receiving his Citation of Merit. All former Chapter officers helped with presentation (from L to R): Mike Cook, Dave Gaddie, Gary Wallace, Rick Gundry, Ernie Roumellis, Kerry Cato, and Frank Jordon. 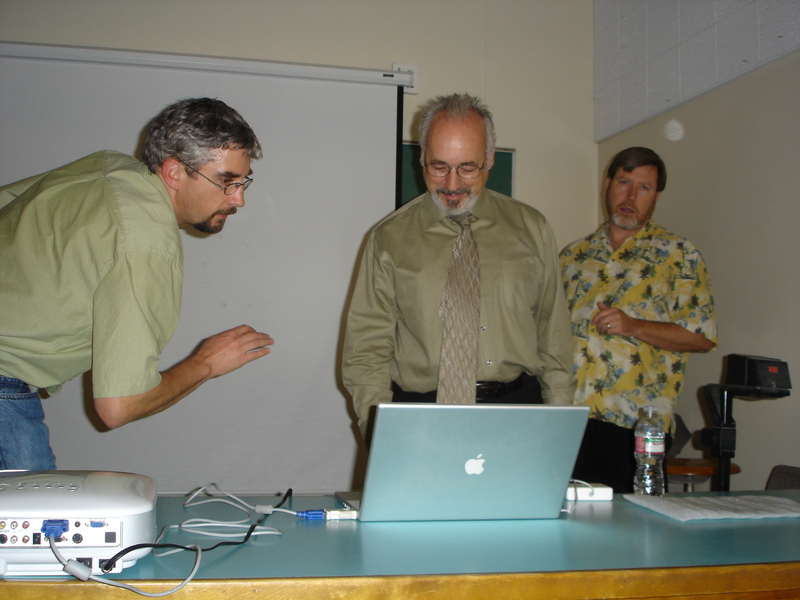 Steve Testa, Executive Director of the California Mining and Geology Board (center) prepares for his talk on future career trends for geologists. Dr. David Oglesby (L) and Kerry Cato (R) look on. 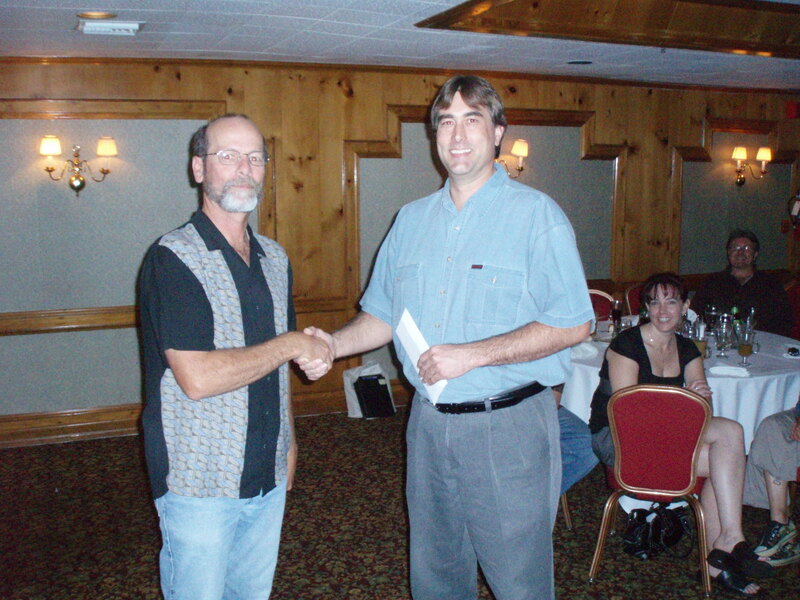 Steve Testa (R) receiving Chapter appreciation from Kerry Cato, Chapter Chairman. 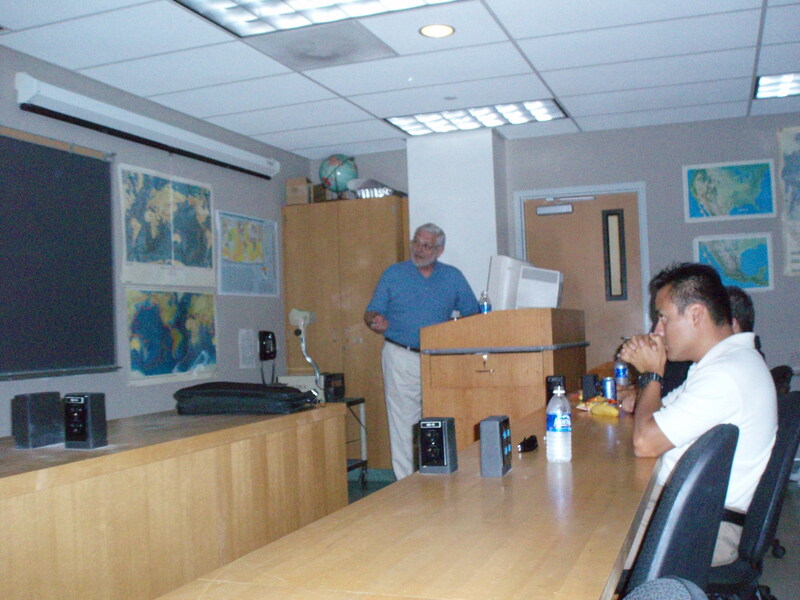 Short Course "California Building Code for Geologists and Engineers"
Photos of Dr. John Clague giving his talk and later with members of the Cal Poly Pomona Geology Club. The back four: (From L-->R): Rob Ellis, Dr. Jon Nourse, Logan Wicks, Charles Johnson(Geotectnical Club). 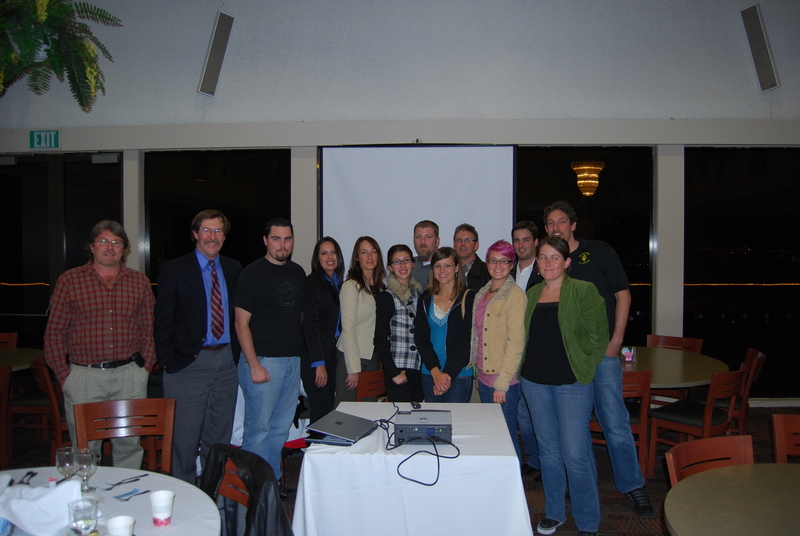 The front row: (From L-->R): Dr. Jeff Marshall, Dr. John Clague, Daniel Heaton, Evelyn Mejia, Kimberly Poste, Allison Ruotolo, Lauren Carey, Jessy Bruns, Julie Brown. 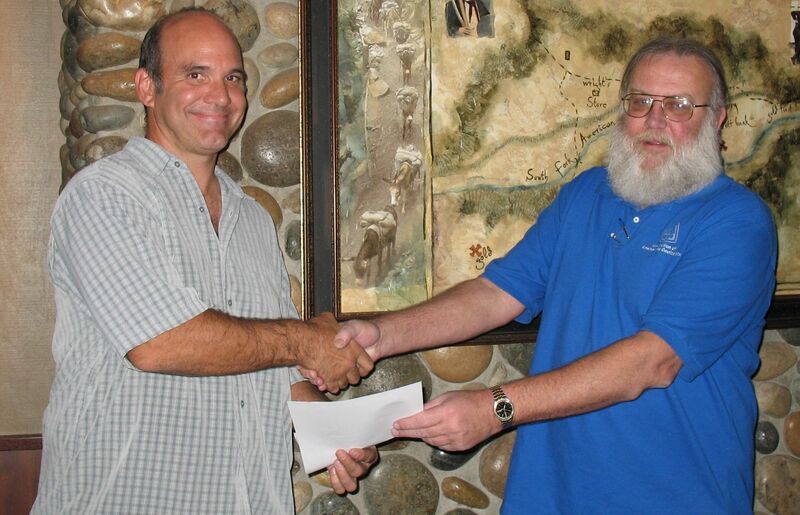 At a recent meeting, the AEG Inland Empire Chapter gave financial assistance ($500/student) to 6 undergraduate geology majors from three local universities. The purpose is to assist with costs of field trips and summer field camp. 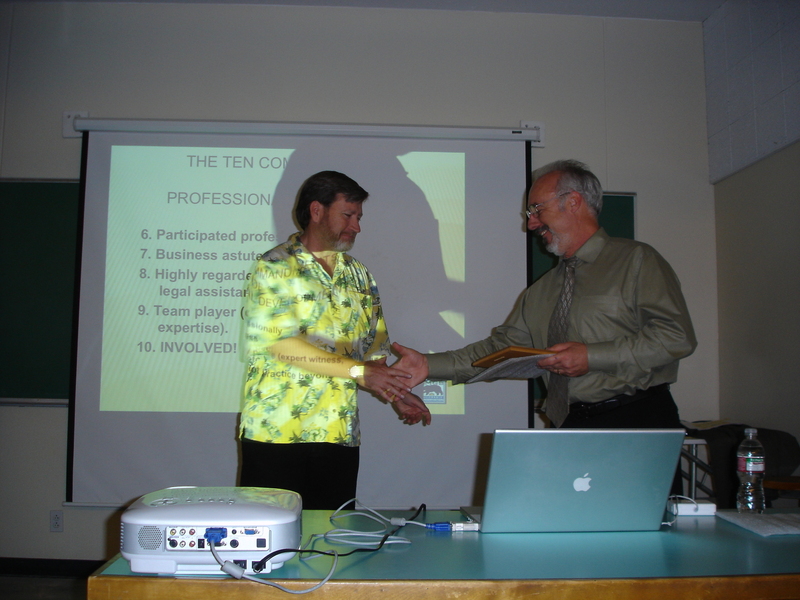 The last four photographs show some of the presentations. 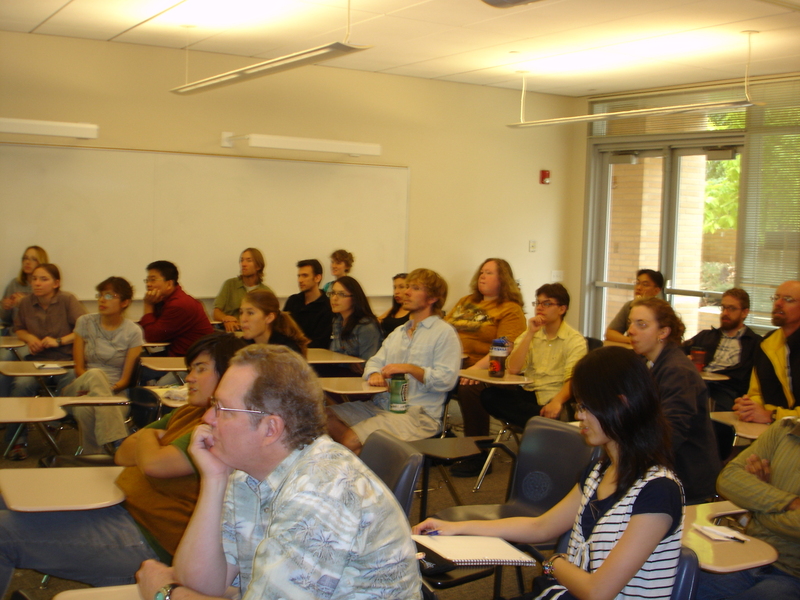 Student attendees in the audience. 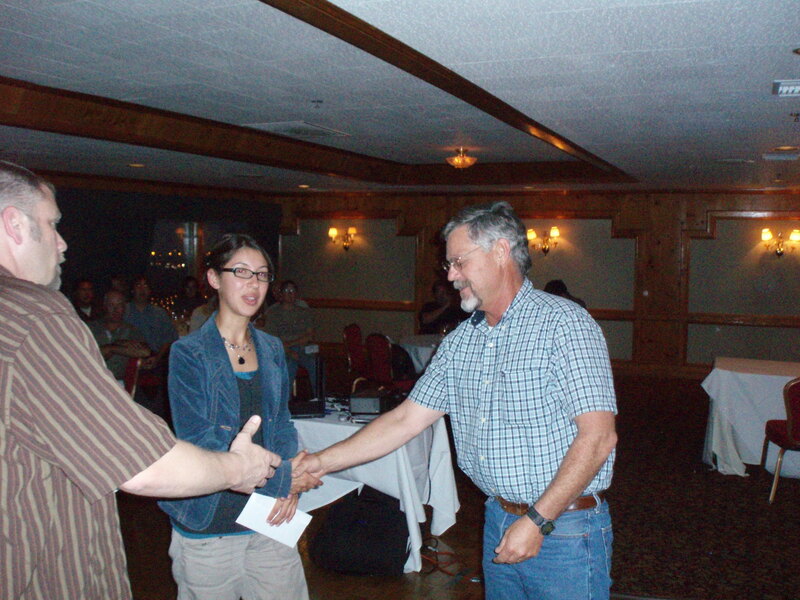 Doug Cook, Chapter Treasurer and of RMA Geosciences, congratulating Allison Ruotolo, Cal Poly Pomona. 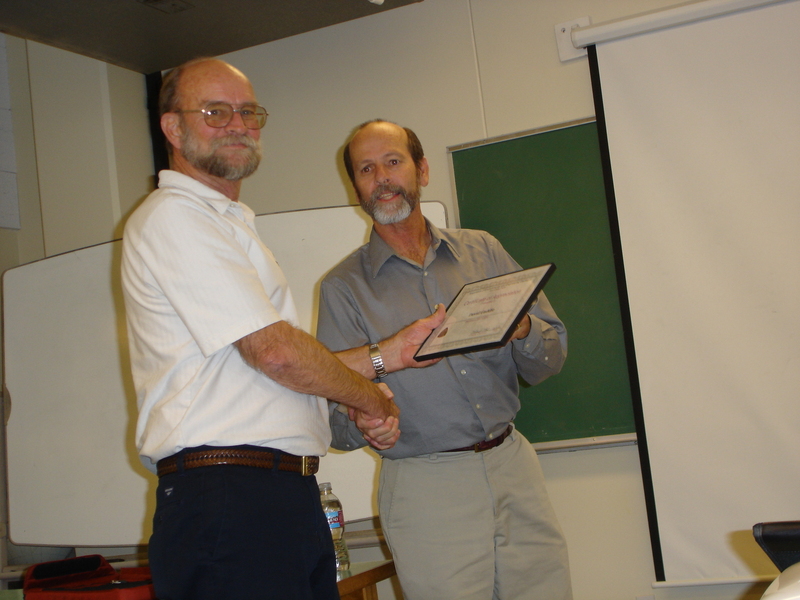 Doug Cook, congratulating Robert Ellis, Cal Poly Pomona. 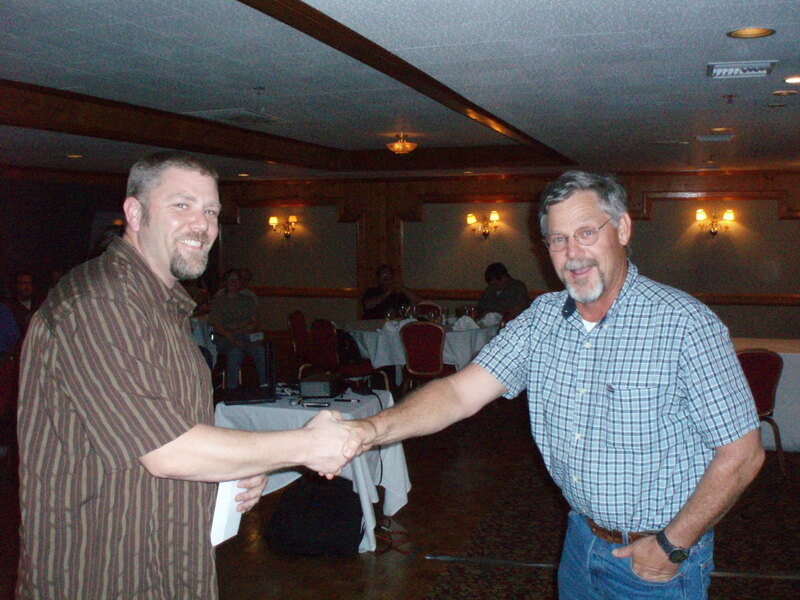 Mike Cook, Chapter Vice President-North and of Kleinfelder, Inc., congratulating Darren Boshart, CSU-San Bernardino. 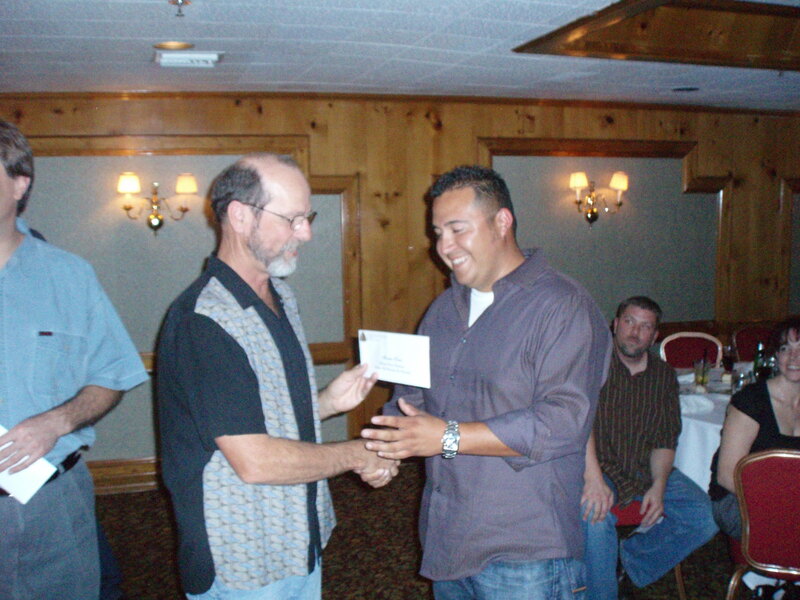 Mike Cook, congratulating Macarrio Torres, CSU-San Bernardino. “Earthquake Hazards and Seismic Evaluation"
"Paleoseismology in Seismic Hazard Assessment; Distinguishing Active Faults from Neotectonic features That Look Like Them"
Tuesday Meeting Steve Testa, Executive Director, California State Mining & Geology Board "Does local lead agency control really work? 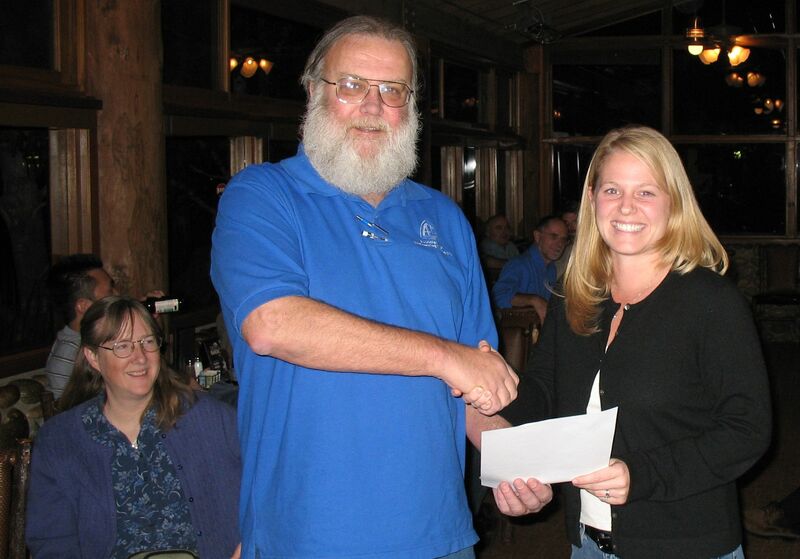 At the November 15 meeting, the Chapter gave out awards to local university students. to support research. Each student received a $250 check for travel assistance to Professional (GSA) Meetings. 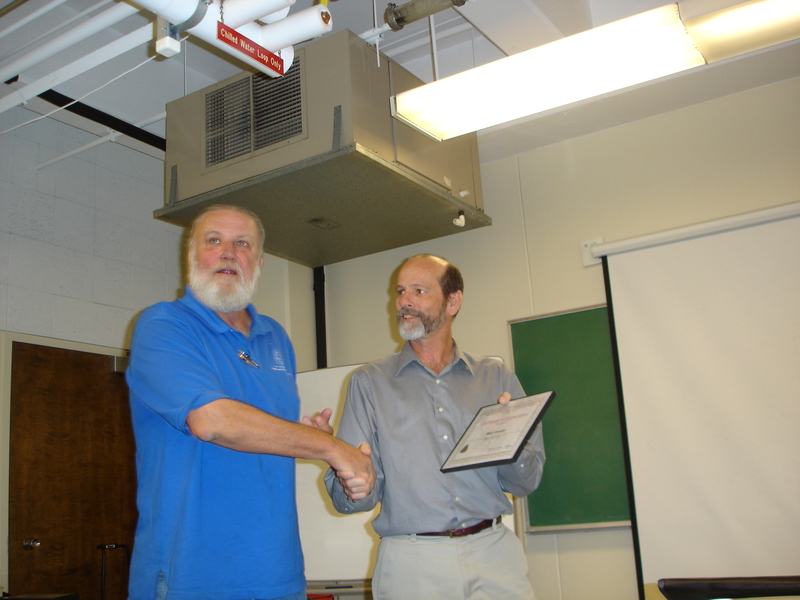 Three COM-Pro Brunton Pocket Transits were awarded to the CSU-San Bernardino Geology Department for training students and field camp usage. Chapter officers were also recognized by the Section. IMG 0820 Chapter President Rick Gundry presents Award to Diana Boyer, graduate student @ UCR, as assistance for her presentation at the recent GSA meeting. IMG 0821 Chapter President Rick Gundry presents Award to David Mrofka, graduate student @ UCR, as assistance for his presentation at the recent GSA meeting. 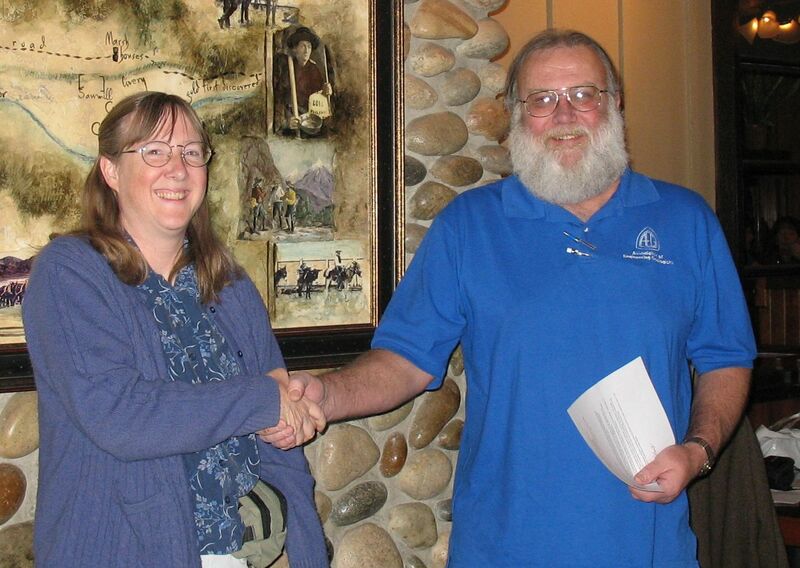 IMG 0822 Chapter President Rick Gundry presents 2 Brunton compasses to Dr. Sally McGill, in support of CSU-San Bernardino. 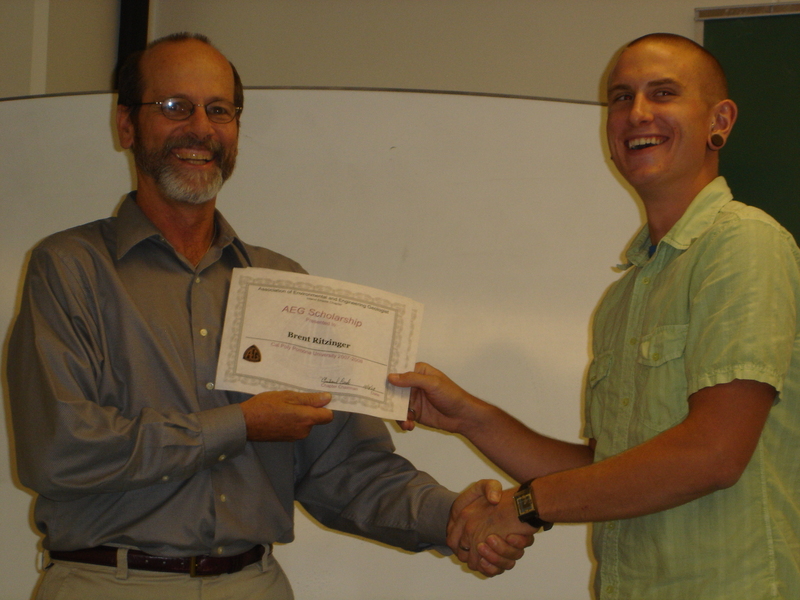 IMG 0823 SAME IMG 0824 Chapter President Rick Gundry presents Award to Robert Ellis, student @ CSU Pomona (Cal Poly), for assistance in his presentation at the future GSA meeting. IMG 0825 Chapter President Rick Gundry presents Award to Allison Ruotolo, student @ CSU Pomona (Cal Poly), for assistance in her presentation at the future GSA meeting. IMG 0826 Former Section Chairman Charles Nestle presents Award to Past Chapter President Gary Wallace regarding Gary's service as Chapter President in 2006. IMG 0827 Former Section Chairman Charles Nestle presents Award to Rick Gundry for his sustained efforts in organizing and continued service to the Inland Empire Chapter (not to mention the numerous late night emails). 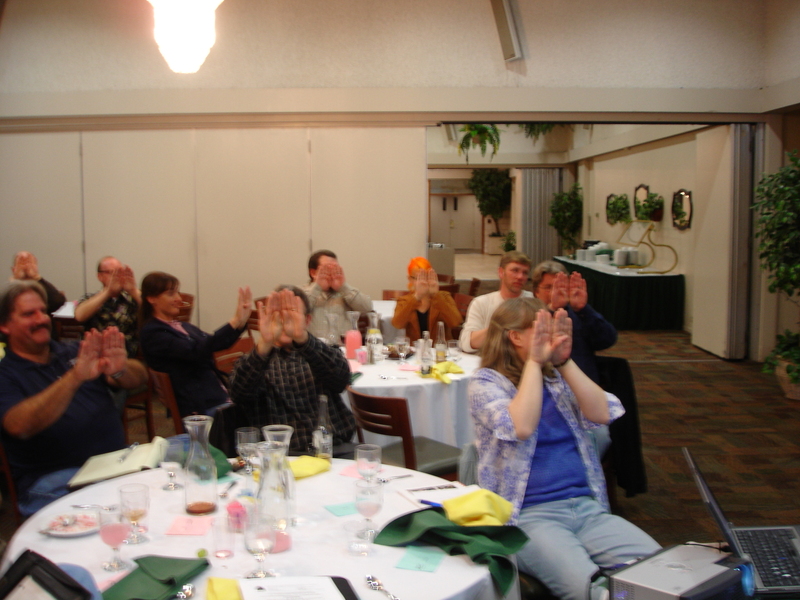 Nov 5, 2005 Multiple Speakers Landslide Short Course. 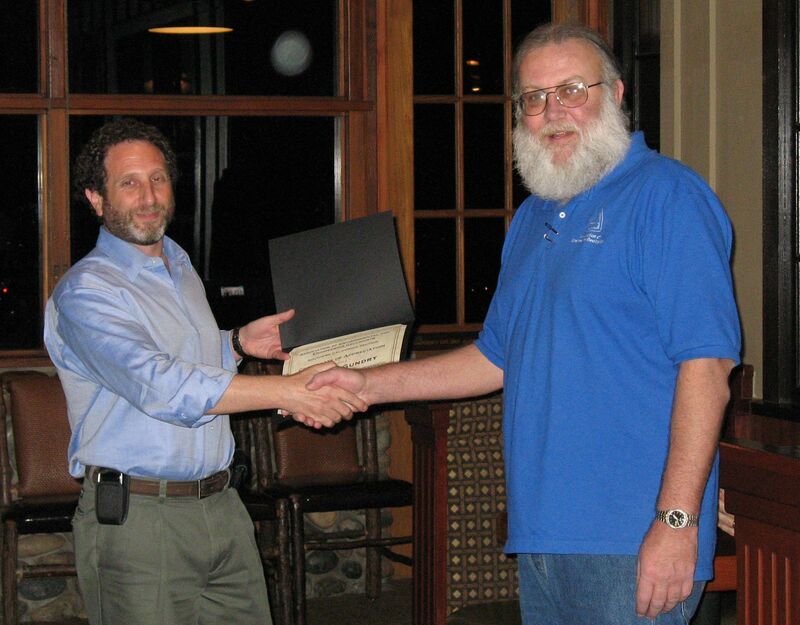 Woody Higdon, Geo-Tech Imagery "Monitoring Slope Deformation with Quadrilaterals for Pipeline Risk Management"
May 18, 2005 Attendees "The New Chapter-Information/Organizational discussions"